With a few exceptions, most all marine shrimps are nocturnal crustaceans that are reclusive, often not being seen once introduced into an aquarium. Primarily scavengers, shrimps come out at night to eat most any type of foods. The Pacific Cleaner Shrimp Lysmata amboinensis and its Caribbean counterpart Lysmata grabhami are no doubt the most popular of aquarium shrimps. True to their name, they clean parasites and debris from marine fishes. Not only are these shrimp beneficial, but entertaining to watch as compliant fish come to the "cleaning station" to be groomed. Contrary to popular belief, the shrimp's red and white stripes do not totally protect them from predation by larger fish, such as eels, triggerfishes, and other opportunistic carnivores. Stenopus hispidus gets along well with most fish and invertebrates in an aquarium. However, triggerfish and many eels will dine on Coral Banded Shrimp when given the opportunity. This shrimp has been known to actively clean fish when presented with parasites. Lysmata wurdemanni is a nocturnal and reclusive Caribbean shrimp that stays hidden, and once introduced into an aquarium may never be seen again. Reputed to eat pesky unwanted aiptasia anemones, this shrimp may also consume small polyps, and therefore can cause considerable damage to a mini-reef system. Do not confuse this shrimp with its subtropical eastern Pacific Lysmata californica counterpart, was this species will not live long at normal reef temperatures. All having the characteristic "hump" on their back for which they are aptly named, there are many Rhynchocienetes species of Camelbacks found in tropical seas worldwide. 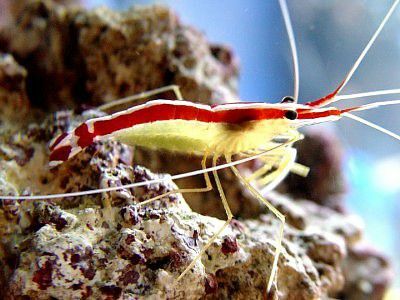 These shrimp are extremely proficient tank cleaners, which makes them desirable, and are attractive due to their vibrant cherry-red and contrasting bright white stripes or dots, but beware! These shrimp will eat corals and other polyps, and therefore are not reef safe. Lysmata debelius is a stunningly beautiful shrimp with its vibrant scarlet or blood-red body and contrasting brilliant white speckles, antennae, and legs, but sadly due to its nocturnal and reclusive behavior, in a normally lit reef tank, it's often not seen at all. Some reportedly prey primarily on polyps​ and therefore is a poor choice. This is a very shy, mild tempered shrimp, as well as delicate and sensitive. It prefers hard rocky or coral substrates, rich with lots of hiding places. During daylight hours it keeps hidden and only goes out to feed at twilight hours or complete darkness. It is almost always found in pairs with the female being the larger of the two. The Mantis Shrimp is a beautiful animal, but care should be taken when adding one to your aquarium. There are two hunting categories of Mantis Shrimps: the "spearers" and the "smashers". The "spearers" use their spear-like claw to silently stab soft-tissued prey. The "smashers" use their forceful, club-like claw to hit, crack open or pulverize harder bodied prey, i.e. snails. Dr. Roy Caldwell provides More Information About Mantis Shrimps.